The RMS Lusitania, designed to be the fastest ocean liner in service, was launched in Sept. 1907. Owned by the Cunard Line, Ltd., her maiden voyage was from Liverpool, England, to New York. Her 68,000 horse-power engines allowed the Lusitania to travel at an average speed of over 25 knots per hour (28.8 miles per hour). That same year the top speed for a Model T Ford was about 45 miles per hour; a Stutz Bearcat had a top speed of 85 miles per hour. For comparison, by 1969 the Queen Elizabeth, another large Cunard luxury liner, had a maximum sustained speed of 28.5 knots (32.8 miles per hour). In 1913, with war clouds looming, the Lusitania was sent to dry dock to be fitted for government service: ammunition magazines and hidden gun mounts were installed on her decks. On May 1, 1915, the Lusitania, captained by William Turner, left New York bound for Liverpool on what became her last voyage. Although the German embassy had placed advertisements in New York newspapers warning that any ship sailing into the “European War Zone” might be attacked by German submarines, the Lusitania nevertheless sailed, carrying 1,264 passengers, including 124 children and infants, and 693 crew members. At 2:10 p.m. on May 7 a German submarine, U-20 captained by Walter Schwieger, torpedoed the Lusitania as she cruised eight miles off the coast of Ireland. After the torpedo hit, a second, larger explosion quickly followed, and within eighteen minutes the Lusitania sank. Schweiger said in his log, “… great confusion on board … they must have lost their heads.” (“The Lusitania.” HistoryLearningSite.co.uk. 2014. Web) One thousand one hundred ninety five of the 1,959 people aboard the Luisitania died, 123 Americans among them. Captain Turner survived although he had been washed overboard and spent over three hours in the sea. 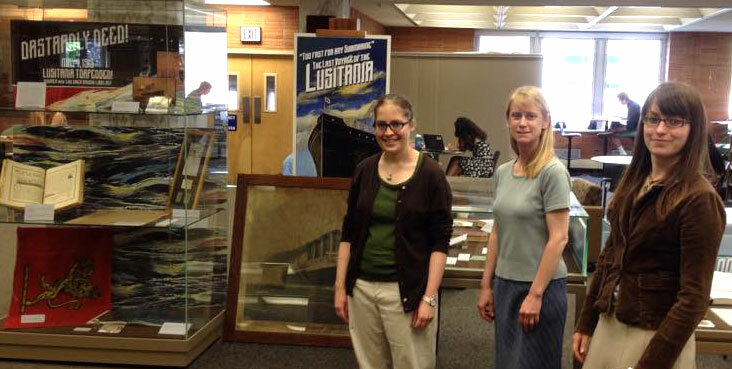 Installing the Lusitania exhibit are (l-r): Laura Bang, Alison Dolbier and Marjory Haines. 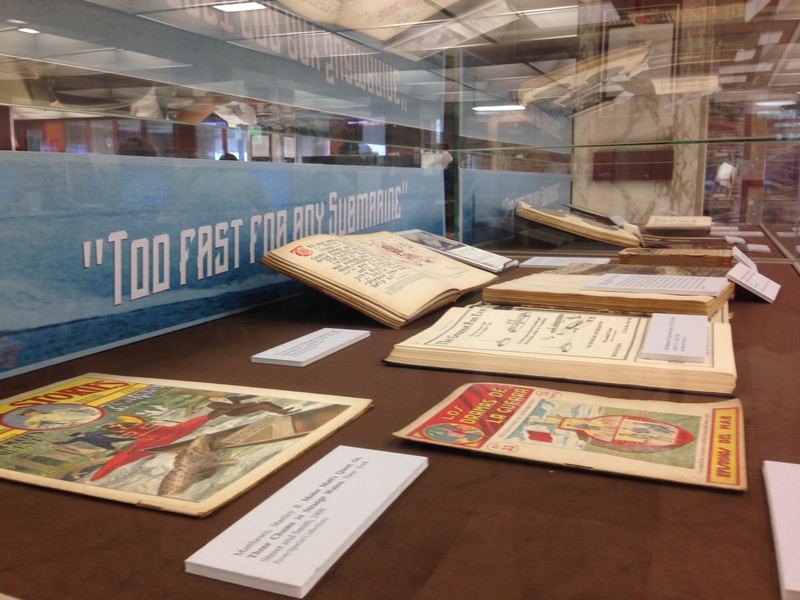 This event sets the stage for the current Special Collections exhibit, “‘Too Fast for Any Submarine’: The Last Voyage of the Lusitania,” curated by Allison Dolbier, a Digital Library intern. Laura Bang, Digital and Special Collections curatorial assistant; Michael Foight, Special Collections and Digital Library coordinator; and Marjory Haines, intern, helped Dobier install the exhibit, which fills seven display cases. Joanne Quinn, graphic designer and Communication and Service Promotion team leader, created the graphics. 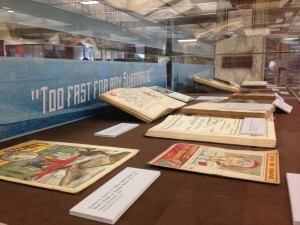 The exhibit is multi-faceted, incorporating a wide variety of materials: newspapers, children’s books, two medals, photographs and more. A large poster, “Dastardly Deed!” captures the eye and leads one to the beginning of the exhibit in the upright case; the dastardly deed is, of course, the German U-boat’s attack. On the top shelf is the curator’s introduction, “A Fateful Voyage.” And on the same shelf is a color postcard of the Lusitania, mailed in 1909. On the next shelf are a 1913 two-page advertisement for the Cunard Steamship Co. in The Fra: A Journal of Affirmation, “Are You a Citizen of the World? 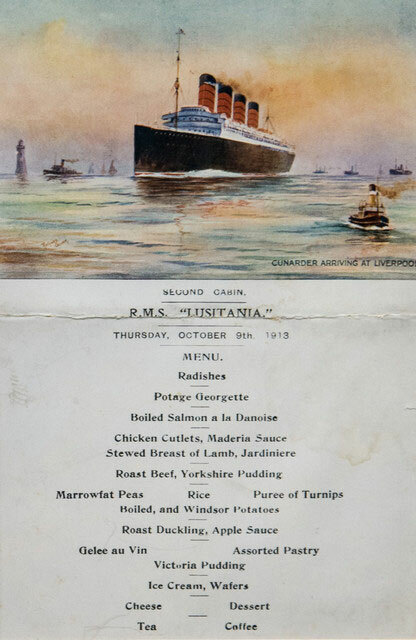 An Advertisement by Elbert Hubbard.” There is a newspaper from Panama City, May 9, 1915, with a prominent headline, “Death’s Toll of the Lusitania, 1346.” There are also a menu and tickets in a frame as well as a copy of an advertisement for the Lusitania with a “Notice” below warning travelers. The “Notice” is signed by the Imperial German Embassy. On the bottom of this case is a bright red flag with a golden yellow lion, a Cunard Steamship Company flag on loan from Eugene L. DiOrio, a small bottle containing rust from the Lusitania and its certificate of authenticity, and Exploring the “Lusitania”: Probing the Mysteries of the Sinking That Changed History, 1995, by Robert D. Ballard and Spencer Dunmore. 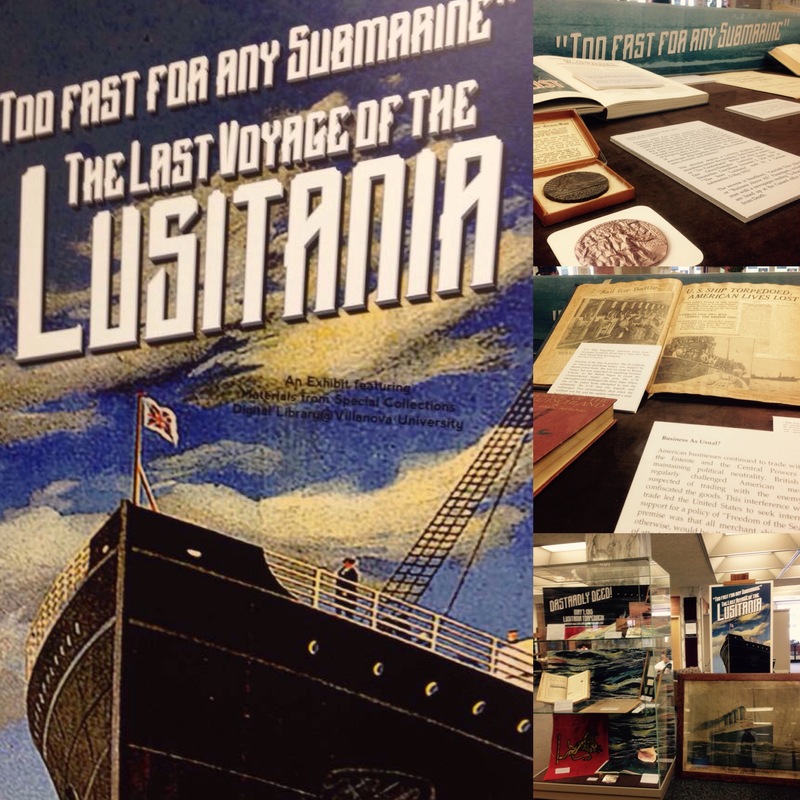 This book is open to show the Lusitania as it appears underwater today. There are six more cases, each labeled “Too fast for any submarine,” the claim made for the Lusitania. These cases contain a variety of materials such as books, a newspaper scrapbook open to a clipping with the headline. “U. 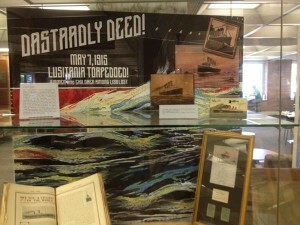 S. Ship Torpedoed; American Lives Lost,” pamphlets from 1915 and ’17, two medals, and much more. One case is dedicated to “The Irish advocate for Germany … and Independence,” and another case focuses on “German-Americans and the case for American neutrality.” These two cases remind viewers that the United States is and was a nation of immigrants and there were often conflicting opinions about the Great War, World War I. Highly informative and often visually appealing, this is an exhibit worth multiple visits to fully absorb its offerings. The exhibit will continue until mid-September.